Hey everyone! Warden Changes! Focused feedback to would be a great help as we tune these changes, so get some play time with them and share your impressions! We will be doing at least one additional round of changes. Most of these changes are quality of life improvements. We scaled up ratings-based buffs to keep up with recent stat changes. The Blue Line now also has a single-target force taunt in the form of Warning Shot. The Yellow Line has also had many of its buff lines updated. Re-balanced damage across Ranged Offensive Strike, Ranged Combination Strike, and Ranged Boar's Rush. Ranged Boar's Rush is now deals the most damage of the three skills. Bonus damage granted from executing the Gambits in sequence has been removed, and the damage distributed into the base skill damage. Marked Target and Diminished Target Duration: The player should spend less time refreshing these debuffs. Increasing base duration of Marked Target and Diminished Target from 10 seconds to 35 seconds. Persevere and Impressive Flourish buff chains have updated ratings. As I have said before, you need to focus on blue line. They need 2 additional gambits that give extra 2-3% more mitigations to both damage sources and existing mitigation gambits buffed by 1-2%. On top of this one gambit given with -5-10% damage reduction that cant be kept up 100% time but situational usage. Fact just is warden cant take damage and increasing self heals wont do a jack when you get simply 1-2 shotted by raid boss. Warden is too much of hinderance to work on current game where boss fights are all about getting hit really hard and you cant avoid attacks (fingar, sagrog). It cant be passive traitline bonus, it needs to be gambit effect. So maybe I've been under the wrong assumption this whole time. I was under the impression that the primary role of the Warden was to act as a tank. At least, the character creation screen has them as a "defence" class. When I read these changes, my thought is "are wardens supposed to be a ranged support class?" Sure, there's a few tank related changes here, but "corrections" is probably the better word for it. The one change you had me excited for, but then quickly lost me, was giving Warning Shot the force taunt. I'm not sure if the 60 sec duration is for the -outgoing damage only, or also the force taunt, but if its the previous, then having a 1 target force taunt on a 45 sec cooldown is a bit excessive. You've already essentially declared that its fine to have the outgoing damage debuff on persistently by having a 15 sec gap between cooldown and duration, so clearly this would only hurt the taunting portion of the skill. Changes look promising all in all. Please consider lowering gambit builder animation times, esp. for ranged builders. Consider lowering animation for dance of war. Remove damage mitigations by challenge and add a similar damage reduction on a longer cooldown to a new skill. Add a 20% flat moral bonus to the wardens tank line. Maybe even an additional 10% when using the full blue setbonus, do NOT increase the incoming healing or mitigations. This way the warden plays differently then other tanks in game and needs to heal the additional damage he takes, but wont get 1-shot. Add some kind of a mitigation cooldown 10-20% on a longer cooldown to the wardens kit. Probably similar to shield tactics. With all due respect, I think you guys have your sights set on the wrong thing. Yellow line should be the least of your worries when it comes to Wardens. Yes, it's useless, and no one uses it, but I don't think these changes will change that. It needs more than just numbers being changed for it to be viable. With that in mind, don't you think it would be a better idea to instead focus on blue line or red line first off? Wardens have a lot of issues that need addressing with their core playstyles (melee DPS/tank), them being, going DPS doesn't do enough damage to compete with hunters or RKs, and it's not like AOE DPS is really needed with current content in the game. And with blue line, they're simply just not tanky enough to survive the encounters that a guardian easily could while taking almost no damage. For example, make it so blue line ups your mitigation caps for physical and tactical by 10%. That'd be a great start. I think the single target taunt is a step in the right direction, but it's simply not enough. Raid groups will still prefer a captain or a guardian over a warden when it comes to tanking, and I think that's an issue. It needs to be even for all 3. What I think needs to be done is wardens need to be less squishy in blue line, and maybe up their damage scaling in red(but not to the point that it was at in u17 or anything). I don't mean any of this to be bitter, but if I can't play Warden in high end content without being at a disadvantage, frankly, I don't want to play. I only want Wardens, and this game, to improve. Single Target taunt is a VERY needed change(Despite what others are saying, the cool down is fine in my experience. I only have problems with needing a single target taunt rarely i.e the Falranc the Hewn in Abyss ID 1 t2c). I also think the duration change to marked/diminished target is a VERY good change. However, the effort spent changing so much of yellow line is really needless. Wardens currently using the best possible gear available with all Vitality essences don't get 1 shot by anything. However, this wasn't the case when the content was first released. Imagine this: you're in a raiding kinship that uses a Warden as their main tank. Without the best possible raid gear(and even some gear meant for might classes), it is PHYSICALLY IMPOSSIBLE to tank abyss in t2, sometimes even in t1 a significant challenge if you don't somehow cheat to get up to a certain morale threshold. Thus, that kinship is going to either have to kick their Warden to the curb, regardless of his or her skill. So, either give wardens some sort of morale bonus from vitality in blue line, or give them a way in blue line to gain enough mitigations to not get 1 shot in a single target situation. Dev's you don't even have to make it easy, make us work for it please! I don't mind playing the most difficult class in the game, as long as I'm not handicapped in the role I'm meant for. Red line is fine to be honest, raid mits are the main issue causing a rift in the dps. I can keep up with the best hunters and rk's in my kinship in a Rakothas parse(single target no movement), they only pull ahead because of certain raid mechanics. There is no reason that a class labeled as a "defense" class should be outshined in a raid by a yellow line captain whose class is labeled as "support", regardless of player skill. Mastery traits have been scailed to useable levels, but the fire at will trait set bonus in yellow still gives extremely low values (2,5k for 10s). Increasing dimished/marked target is very nice, also the animation seems to be a lot quicker than it used to be. But this will also mean that the warden yellow raid set is completely useless. Increasing the Impressive Flourish chain buffs is almost useless since most wardens will be capped on mits without using those. (Since the buffs do not last long enough to keep up all skill rotations getting mits in your gear is the easy so you can cut this out) Therefore it is virtually useless and will only be a waste of time if this bonus gives mits rating and not percentage. Since there was a bugfix with battle-memory is there any chance we get a fix for gambit chains not working with gambits stored in battle memory? Ranged Warden's Triumph is a somewhat stronger buff, but since yellow line is not a real dps line but more like a (de)buff line doing this skill is just a waste of time. Making it fellowship wide can make it a skill that is timeworthy. For any group to take a yellow warden, this line should offer something usefull that other classes do not have, something that comes close to it or have a special something to offer. Since neither of these cases apply for yellow warden it will never be worth to take one in a group or raid. This feels more like a nice second line to blue/red since the damage/buffs/debuffs are below average to be considered good or usable in any of those classes. Most dots still seem to be bugged in the sense that they do not stack with dots from other wardens! The only real lines that are currently used by wardens are blue (for tanking easy stuff or if extremely geared raid) and dps (for solo/pvmp all else is just sad compared to other classes). Red line is fine outside of the low damage on dots compared to the damage the other classes do. (Dots only scale with mastery not dps from weapons, which means no runes work on warden). What might also be a nice addition to red warden for example is giving the Spear of Virtue line have a chain bonus that gives a debuff on the enemy (-light mits, inc healing etc) this can also apply to other offensive gambit lines. Most of these things are just my first thought looking at the patch notes and playing a bit with the new buffs. Last edited by Rorrelm; May 10 2018 at 08:13 AM. Warden has some problems, but as concerns the "tanking" line I was under the impression that they were getting squashed mainly because of lower morale pools (the Agility tanking stuff has less Vitality and is stacked with Evade, not useful stats like mitigations) and lower mitigations than Guardians and Captains. In some fights their superior BPE isn't even applicable because attacks just bypass it, so they take much bigger hits with less morale. To some extent, that's a problem with instance design and not the class, but the single target taunt is great. is there any redline changes this patch or just yellow/blue ? Ranged Adroit Manoeuvre/Triumphant Spirit duration buffs - Good changes & make Truimphunt Spirit worthwhile using again. Ranged Offensive Strike Gambit Line Damage Redistribution - Removes the need for using the line & now just use ranged boar's rush. Indifferent of the change but overall 2 less things to do. Marked Target and Diminished Target Duration - Would like to see the overall debuff increased to traited values. Overall positive for a blue warden but negative for a yellow warden. With the base duration being 35 seconds I don't see many people spending points to extend duration. Assailment Gambit Debuff Durations - Don't see the point. Does this mean that the increased durations mentioned previously are obsolete if you are in assailment stance? I guess less time debuffing and more time spamming high damage abilities might increase overall dps but yellow line is not known for it's dps. Persevere and Impressive Flourish buff - Persevere will see use as it always has. IMO Impressive flourish still won't. So far focus mostly on yellow line with few QoL changes to tanking.Its almost as if you dont read what people say should be done.Why not first focus on 2 most played specs?Why are you dumbing down class with forcing marked/diminished target skills?One of most fun classes to play with most potential for good comlpex rotations get put down to hit 2 buttons press force taunt and do nothing? Why not remove those 2 skills and split % mitigation debuff across DoT gambits for example so one needs to keep all dots to keep mitigations debuffed instead press 2 buttons?Sure its probably not doable with resources you have for this but still you get the point. And during this class balance change I will repeat what has been said since mordor came out Any non fire DPS will never be competetive as long as fire mitigations are kept at 0% with basicly no effort where one has to use earring warden of FI set warden to have that effect for physical/light dmg dealers.Now if you want to go to 1 class 1 role at least say it so people dont have false hope of things getting changed. Also check whats up with finesse as in raid one needs 30% or roughly 201k in order for dots to not get resisted.This is problem for few other skills unrelated to warden so you might wana look at it. One change for tanking that you could do is separate DC mitigations from force taunt,so one can go in use mitigation buff for harder pulls and then force taunt to get aggro,Maybe attach it to gambit with 1 min cd and 10 15 sec duration and give small % mitigation buffs to defensive gambits that require constant rotation to be kept up. These changes so far are quite poor and not even worth your time/resources outside of maybe ST force taunt that is just QoL change since people are used to work around it.Gona wait if something better comes up in next changes but from what i see here i doubt it. I've got to also jump in and say I find it pretty disappointing that the majority of the changes were for the yellow tree. It's a nice thought to make it a viable tree, but even with these changes I'm not seeing when I would really make an effort to play it over blue or red. I barely play yellow, if ever, as it is, and so I don't really have much to say about the changes that were made. I think it would have been a much better plan to work and adjust the blue and red trees to make them more desirable than they currently are, and then once that's done start working on yellow to bring it in as an alternate spec. Because as of right now the changes to yellow aren't going to help us in the areas we need the most help in. It will impact very little, and being honest it confuses me a bit why yellow was chosen to be worked on first. I was really hoping to see some changes to the red tree as warden is a bit lacking in dps compared to other classes, and there's multiple boxes in the red tree that just aren't very good such as spear sweep, honed spikes, etc. Personally I'd just like to see these changed to something else that would help dps as a whole, though I'm not sure exactly what. The gambit system is a lot of fun in a dps role, and there's so many offensive gambits that it's really a waste to not make warden a competitive dps class when in red. I do like that we now have a single target taunt, though I haven't gotten a chance to give it a shot in a group on BR yet. It's a shame blue didn't get touched more than it did though. It also has a couple of boxes that just aren't worth using like impressive flourish, which gives 1020 physical and tactical mitigation at rank 5 at level 115, or war-cry with a 2716 evade rating at rank 5 level 115. I myself am still somewhat new to level cap warden, so others will be able to provide more specific feedback and suggestions, but these are just general things that first come to my mind. The more useless boxes were the ones I was hoping and expecting to see worked on in red and blue to help bring us up to the level of other classes. I've been somewhat uninspired to continue my warden when I could be working on other classes that work better. I was hoping this first balance pass would change that some, but unless there's more coming in another build before live, it doesn't seem like that's going to be the case. Appreciate the effort, but I feel it was misplaced for warden's current state. I simply can't understand what problem do you guys want to solve when u make changes with yellow line? If you want people to try using yellow line so wardens should understand what for it was made. With this changes you didn't improve anything! People will continue avoiding yellow. I think you (devs) chose a wrong road improving yellow line. This line needs strong revamp, not improvements. Nowadays warden's potential role in fellowship/raid is tanking. The situation in raid now is terrible: Raid tank = guardian. If you say that you want to tank it with your warden , people become nervous. I know only 2 wardens that tanked AoM t2c. So there is a choice without choice. Skill Shield Mastery(special in blue line) now it gives you only bpe, but it's useless for raid bosses or mobs on t2c because they attack you with special strikes that you can't bpe. Solution: When warden use Shield Mastery he goes into the defence. Using shield mastery temporarily significantly increase warden's survivability. (-15 or - 25 % incoming damage for 1 minute, loose -5% healing gambits potency.) CD - 1 min. Dance of War! Amazing animation. Nice looking skill, but absolutely useless. Make dance of war work like a emergency skill, that can give warden 10-15 sec % evade buff (35%-50% or smth like this.) Right now this buff is useless because all wardens capped their mits and crit defence. There's no need to use dance of war for +2% of physical mits. (when i say people about +2% buff they start laughing). Decrease warden's defiance percentage from taunt. Make it +6% per target. Cooldown: 1-2 min or smth like this. Warden got enermous problem. Spiky strikes against solo bosses. I tanked t2c aom bosses and my mini told that it was x2 harder to heal than cappy or guard. Warden must be a good tank against solo bosses same as against multiple enemies. Solution: increase morale pull in blue line (passive skill +10 or + 15% morale in blue line). Wardens should have their primary role: tanking. Right now nobody can say without a doubt who is warden. I hope there will be more blue line changes in next round. Thanks for new single target force taunt, implementing into Warning Shot is good choice. Consider return of +10s buff duration for fist, shield and spear gambits. Increase "Conviction" and "Dance of War" mitigation bonus to +5%. Avoidance tank should not have acces to 60% mitigation, i think 55% mitigation is max. Add -15% Incoming Melee and Ranged Damage buff to "Shield Mastery" or make new blue line passive buff - Next full hit (no BPE or partial BPE) will be reduced by 50%, remaining 50% will be distributed to 5s dot, you cannot gain this effect more than once every 10s. Add -15% Incoming Tactical Damage buff to "Shield Tactics". Increase heal potency of "Persevere", "Safeguard" and "Conviction". Self heals should be scaled up to reflect higher morale pools. Scale up instant heal from "Restoration" or make it % based, 10% morale heal. Nerf "Never Surrender" double cast, start 5 minutes cooldown after NS heal proc. New: every "Shield-bash" builder use will reduce NS cooldown by 10s. This will prevent double NS use, but cooldown will be shorter in combat. Nerf "Deffiant challenge" mitigation buff, remove mitigation buff from force taunt completely. Change capstone skill "For the Free People" - Enter a state in which every Gambit Builder builds a stacking Mitigation Buff for your Fellowship. +3% mitigation/gambit for Warden and +1%/gambit for others, maximum will be 15% for warden and 5% for the rest of Fellowship. Duration: 15s, Cooldown: 1m 30s. This can serve as deffiant challenge mitigation buff replacement. reduce animation of "Surety of Death" if it is casted from Battle Preparation, reduce next skill delay after "Surety of Death" use. stun immunity from "Shield Tactics" should be immediate buff. all gambits from battle memory should be same as original - "Ranged Adroit Manoeuver" buffs and "Ranged Restoration" heal. increase buf duration of melee "Adroit Manoeuver" and "Warden's Triumph" to 35s and boost their damage. Move trait "Warden's Triumph" from row 6 to row 2, 3 or 4. This trait should work also on "Ranged Warden's Triumph". Also these gambits could be available in earlier levels. make new runes for legendary weapons and items with stats like +incomming healing and + % partial mitigations, something useable for tanks. Somehow lower morale gap between tank classses, buff morale of Guardians and Wardens or remove +% morale from Captain and Champion tank trait lines. I prefere second variant, only Beornings in bear form should have morale bonus. Last edited by Krindel; May 15 2018 at 05:28 PM. I really appreciate the Single target forced taunt on warning shot. I also really really like the changes to marked/diminished target. Decreasing the % but increasing duration and making it accessible to all lines is a great change. Of all the changes I could have asked for I think these are the best ones. I've tanked boss 1 and 3 for abyss t2c and have to echo the points made in previous posts on this thread. Boss 2 is physically impossible to tank no matter what gear you use as a warden and no matter what skill you have. Only role for warden on boss 2 abyss is adds and you can only do it successfully if your group has very good dps. Can't tank up to 10 adds like a guard can. I will quote something Tybur said in her recent video interview with Cordovan, "What's the role of this class; can they perform that role? Does it feel fun?" furthermore, "The warden for example, was meant to be a really high skill" class that one must practice/know all abilities "but if you do and you are, then you should be the best tank in the game". This is literally a direct quote from a key long term dev who has been around practically since the inception of the class. She is clearly stating the intent for warden to be a high skill tank class that is THE BEST TANK IN THE GAME. I don't care about my dps, I play a champion for that. At the very least give Blue line warden's the toolkit to not be a liability in raid content. Yes some might say but warden's can tank Abyss t2c, just the really good ones. To this I'd say, we're 6 months deep into the raid, the only wardens who have/can tank it are playing with the absolute best players, using the absolute best gear, cheesing mechanics by stacking enough morale to just smidge out of 1 shot range from bosses. Give Blue line Wardens buffs to maintain that actually matter, that actually increase our sturdiness as a tank, and that put us on par with guardians in a group setting. Single target taunt was a good start to this, but it doesn't address the key issue of survivability that Warden's currently lack. blue wardens should get their mitigation% bonusses from their gambits increased and taken away from Deviant Challenge. The way DC works is stupid and wardens either need higher mits or morale for the whole duration of the fight. 60% uptime near immortality and 40% of the time possible oneshots is bad design for a tanking class. as many have said countless time all this is irelevent AS LONG AS FIRE MITIGATIONS are at 0% while rest sit well above 40%.I dont realise how you cant understand RK/Hunter will do 100% more dmg in raid than he does on dummy when mitigations drop to 0%.I would post some parses of current DPS but atm BR is lagging hard so I will wait late hours when less people are testing to post. 3.Buff single target just sligthly so they are above aoe ones,atm unering strike dot is at around capped mastery 10k above spear of virtue and almost 20k above desolation,with tooltip around 31k cant say exact numbers for caped mastery as i am in raid build. MOST IMPORTANT THING AND I NEED TO USE CAPS since i am amazed how its not been looked at is mitigation debuffs,on live Champ and Warden would be quite close to RK/Hunter if they had 0% mitigation target,you dont have to make insane number of changes and create work where there is none. Look at finesse for certian skills that require over 200k,Look at partial BPE,and give meaningfull way that doesnt require sacrfice to reduce non fire mitigations to 0% same what rk and hunter have.This would solve 90% of dps problems.Rest would be fine tuning skills and working on more fluid gameplay. By meaningfull way i mean just look how rk and lm put target to 0% fire mitigations with ease.Sure one can use earring warden or Featured instance set again those lucky to have it but that is just amazingly wrong attitude and design.I cant understand how anyone can support marked/dimished warden playstyle when there is soo much skills you could use and have fun with different rotations people support press 2 button bot.And btw even with this set light mitigation will be above 0% and physical will drop to 0% only with double proc.However champ would still profit even from one debuff with his own mitigation bypass. For next build i would sugest you give us 0% mitigation dummies just so you see how things would work on debuffed targets.And for the love of god i cant stress this enough please step away from current maked/diminished target boting.I doubt anyone who has rolled warden rolled it for those to skills. Just wanted to thank everyone for the high-quality discussion and feedback. Thank you, Cordovan, and pass along my gratitude to the other devs as well. The new stat changes in trait lines will make a big difference in all trait lines at 115. The numbers seem to sit at a perfect margin ~11k for max tier of mastery, and ~20k for finesse seems like a very reasonable amount and will work to reduce the necessity for finesse stacking from gear on live. 1. Make the finesse trait line in yellow % based? This will make it so that at lower gear levels, the number value won't be so overwhelming as to force players in all lines to use the trait. However, at higher gear levels, it will provide more of a benefit than it currently does. In my build on Bullroarer, I'm at 151k finesse with the trait equipped, and only gain ~1% from maxing out the trait line. I have to echo some of the things other players are experiencing: even at this overwhelmingly high level of finesse, I still was getting resists when I attempted to Red Line dps for CoS t2c boss 2. This effect will likely be even worse if I find a group for Abyss. 2. Warden AoE DoT's from Light based damage took a big hit. I.E. Desolation tooltip is 18.5k when on live for my character, while on BR it's 15.5k. Spear Gambit damage seems to have increased slightly. All spear gambit bleeds are up by about 1.5k damage per tick on tooltip when compared to live. I'm not sure this is working as intended? It seems to be a result of changes to weapon damage on Legendary items. 3. Despite what others are saying, the changes to yellow line are positive changes. It's a step in the right direction towards making yellow line feel less clunky. However, it doesn't change the fact that yellow line is still going to see very slim use considering the dps achievable from it is approximately half that of red line. 4. Blue Line: Taunt duration from warning shot feels too short on BR. Perhaps increase the tooltip time from 5s to 6s? The time it takes a target to walk to the player from the max range of the taunt outweighs the actual time that the target is taunted for on BR. This essentially renders the taunt moot due to the fact that it's on a very long cooldown. Thanks again and hope blue line can get a second look sometime in the near future! Overall, good changes to quality of life for the class. Also warden bleed tooltip is significantly higher than before, putting red line in about the same bracket as I'm seeing Champs/Fire Rk's. This is a good thing. However our AOE dps has been reduced by approximately 30% due to Fist-Shield line gambit DoT's being drastically reduced. I think it's important to note that Fist-Shield gambits are the core of a Blue wardens aggro management and shouldn't be reduced as much as they currently are. Also the Red line Set 2 piece bonus from pelannor fields raid that gives +25% bleed damage isn't working at all. Is this intended? AoE Light DoT nerf is not ok. Please increase the damage of Fist gambit light DoT - the nerf to this source of damage was not needed nor is appreciated. Warning Shot's animation or attack speed needs modifying - it feels kinda clunky when paired with other skill and gambit animations. Thank you for working on things, all the same! I don't like the focus and time spent on yellow line UNLESS you're going to commit to making it truly viable. As it sits now the buffs are not enough to solidify a spot in T2+ content as a yellow Warden. Ranged Offensive Strike Skill Chain - Debuff Change: This is a step in the right direction but it's not going to change a yellow Wardens position. Ranged Adroit Manoeuvre duration buffs: This 5 sec boost is overall insignificant. You buffed duration when you needed to buff -attack duration first then duration to see how it plays out in rotation. I'd like to see it boosted to -15% for 30 sec, this compliments Endurance Training. Ranged Warden's Triumph Buffs: This is a step in the right direction but it's not going to change a yellow Wardens position. Ranged Offensive Strike Gambit Line Damage Redistribution: Good, I like this change. Gambit Chain Bonus Damage should be removed from all lines and redistributed as such. The idea behind this has never worked as the chain bonus never provided an applicable benefit that outweighted a purposed built skill rotation. Marked Target and Diminished Target Duration: The player should spend less time refreshing these debuffs: First things first, has a level cap been placed on the Revered Warden's Earring? If not that needs to be done or a cap needs to be placed on it so you can't go above what's achievable with Focus Fire. With Assailment anything that speeds up gambiting and increases buff/debuff duration is good so I like this change. Assailment Gambit Debuff Durations: Fine but I ask, what is the role of a yellow Warden? To range DPS, to Support(buff/debuff), both? Ask yourself, why would you pick a yellow Warden over a RK/Hunter or an LM? The yellow Warden needs something unique that other classes can't/don't offer. This change doesn't go far enough. Break Assailment if you need to, this is BR. Trait Rearranging: Small change but it makes sense, I like this change. Warning Shot Changes: Good, I like this change. -Bring Desolation fear chance to red line. -Boost Spear Gambit Damage & consider implementing a Melee Critical Multiplier in red line. -Make Shield Tactics available to all trait lines. -Get rid of Honed Spikes at all costs. -Boost gambit mits and duration in blue line, make Defiant Challenge an AOE taunt only. Blue Wardens need to be on par with Guardian tanks when played at a high level of skill. Reactive with a solid rotation. First of all: Thanks to the Devs for your efforts on the balancing. English is not my native language, so i apologize for possible errors in my text. - Adding a Singletargettaunt was really important and I like the implementation. Thanks for listening to the playerbase. - Scaling the ratings of +phy. mastery in the red skilltree and +Finesse in the yellow skilltree. Also the scaling of the ratings. - Rearranging the position of some Traits. I have to say, in my opinion updating the yellow line to start with changes to the Warden is bad prioritizing. Yellow Warden was never played much because the traitline simply wasn't viable and although it is a great to finally see some work on it, i think most players wish for changes to the blue and red line first. The recent feedback in this thread substantiated this assumption. I will post suggestions for red and blue line after commenting the changes on yellow. YELLOW: These changes are a step in the right direction but not enough to make yellow Warden a desired class in groups or raids. - I appreciate the increase of the debuff duration for marked and diminished target and think this is a good change, because it gives the Warden more time to focus on the actual gameplay (Gambits and especially the Procs in yellow). - You scaled some ratings up, but you obviously forgot to scale the critical rating which is given when selecting the yellow traitline itself - it is a measly +460 to crit. Please consider scaling or adding an other value instead. - The +mastery rating on "Fire At Will" (+2520) seems still to low. Consider reworking this skill or scale it a bit to be usefull. - The setbonus "Dogde this! "/the skill itself seems lackluster. Same goes for the Snapshotversions of the javelinskills (except Javelin Of Deadly Force). When you are trying to deal damage (even just supportdamage since you play yellow), you are almost always better off spamming Wall of Steel for DPS or building some other Gambits like Adroit Manoeuvre for your group. The animationtime is simply not worth the damage the Snapshots or Dodge This! yields. My suggestion is to give the yellow Warden something like the bonus "Unconventional Strikes" from the red skilltree instead. Increasing the procchance for the group-buffs from the Gambitbuilders would fit the concept of the yellow traitline (supporting the group while dealing reasonable damage). An enhanced procchance on debuffs like "Behind The Shield - Marked" which gives a 10% damage to moral return, would greatly add to the viability of yellow wardens. - The now achievable -8% outgoing damage on mobs seem decent, but I can't determine whether it has an actual impact or not. After my observations on BR i tend to assume, that damage output of mobs affected by this hasn't notably changed. Perhaps someone else can privide hard numbers on this? - The Critical Defence Debuff of the Precise Throw Gambitline does not seem to have a notable effect on mobs (!). Although you can debuff a mobs critical defence by 6022+7273+8727= 22022, i could not observe a damage increase of the critical hits dealt to them. I tested this on the training dummies in the tavern's crafting hall, on the dummies in Glân Vraig and on some of the Hidden Threats in Mordor. All targets were debuffed by -22022 critical defence from the Precise Throw Gambitline. For the comparison we used Penetrating Shot (Hunter) and the dotticks of Grave Wound (Captain), since these skills always deal the exact same amount of damage. The results on the normal critical hits (not devasting hits) were compared. There was no damage increase. Proof: http://fs1.directupload.net/images/180510/22hn2x7f.jpg Same goes for the Penetrating Shots. They critted with 71077 damage, whether the debuff was active or not. Perhaps my understanding on how critical defence works/should work is wrong. Please correct me if so. - The increases to the debuff-duration of Marked Target and Diminished Target mean, that the current setbonus on the AoM-T2-Set for the yellow line is useless. With an uptime of 1 minute, there is no need to extend this for another 10 seconds. Even worse, it also means, that those players who were lucky enough to get one or even two of those Lvl 85 golden Warden-Earrings (which they can still equip!) are favored unfairly. 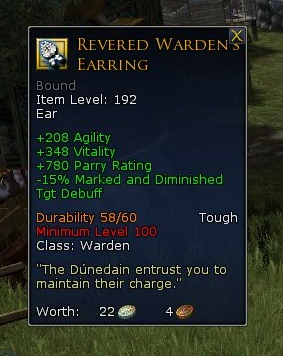 This earring sets the debuff to -15% by default with the possibility to futher increase the effect via the skilltree. Put a maxlevel on these earrings, so they can not be equipped with Lvl 115. Right now, newer players would have to utilize the old Featured Instance Set, if they want a significant setbonus for their yellow line. Playing new content with old sets with old stats isn't particularly funny and does not seem to fit your design philosophy either. Futhermore has the Featured Instance Set become unavailable too. My suggestion is to change the setbonus on the AoM-T2-Set to the setbonus of the old Featured Instance Set. - The DPS of the yellow line in its current state is somewhat okay, but given the lack of potency of the debuffs, it's not viable enough. If you update the potency of some debuffs and add more group benefit in general to the yellow line, to compensate on the lacking DPS, it will be fine. If you decide to keep the debuffs and buffs a yellow Warden brings like it is on the current BR preview, you need to further increase the damagepotential. Either way: Yellow line still needs some work if you really want to make it viable in groups/raids. The Red- and Blueline, especially the Blueline, need way more attention than the Yellowline (imo). These are the core Traittrees of the Warden and are by far the most played. And they are not fine in their current state. RED: Many others already rightly pointed out, that your MeleeDPS classes are too far behind in comparison to the ranged damagedealers (except the Burglar which is now with the nerfs to Hunters and Runekeepers a really strong, if not the best, DD). In general you should bear in mind, that meeles have to take higher risks in a raidenvironment to fulfill their role (puddles, AOEs, etc). Therefore their DPS-potential should be close to ranged DDs (if not on par). All Melees suffer from Finesse not having an effect on Partials. A change to this would not only benefit the Warden, it would benefit all Melees as well and solve a lot of issues. Also the way Hunter with Fireoils, Runekeepers with -Fireresistance and Loremasters with -Fireresistance interact is too advantageous. - On BR with BIS-Gear, 222750 Mastery/130k Finesse/overcapped Crit I managed to phrase ~43000 DPS on the 3-minute-Dummies. I saw some phrases of others reaching about 47-48000 DPS. Compared to the damagenumbers of Burglars in particular, we are way off. Even if Hunters and Runekeepers are nerfed now, given the numbers they still can achieve on BR, we are still off compared to them. - We need a way to resolve the issue with the Partials. And as others stated, the requirement of 200k Finesse to get no resists on DoTs on Raidbosses is also very crippling to our DPS. Wardens need an effective way to penetrate Partials and Resistances. Or you need to change how Finesse works/the system in general. - The Traits "Spear Sweep", "Quick Sweep" and "No Mercy" are useless. As a WardenDD you want to maintain as many DoTs as possible on your target, not cash them out. Also the damage these Traits yield (if you were to skill them) is completely lackluster. My suggestion is to replace these Traits with something more usefull, preferably with a way to penetrate Resists or Partials. - The Trait "Warden's Triumph" has little use, because neither the Gambits "Warden's Triumph", nor "Adroit Manoeuvre" has a place in the rotation as a Redline-Warden at the moment. IMO both Gambits are per se cool and have usefull effects - if they were playable (meaning viable) they would greatly add to the fun of Wardengameplay. My suggestion is to give us a way to extend the duration of the buffs these two Gambits provide, so they can perhaps fit in the rotation and see actual play. If this happens, it would mean, that the Trait "Wardens Triumph" would become usefull. - The Trait "Honed Spikes" is utter nonsense and not worthy of being a capstone for the Redline! Please remove it and give us something usefull/worthy of a capstone instead. Desireable options for a replacement were given in this post and in this thread. BLUE First an analogous quotation of Tybur from the Anniversary Stream: Wardens were designed to be the best Tanks, if you can utilize their full potential. Given that - if i recall correctly - you aim to bring some of the old "class fantasy" back, the Blueline desperatly needs some changes. Wardens were the second Class added, which was meant to be a fully viable tank and, oh boy, have Wardens fallen behind. Adding a singletarget taunt was a good and necessary step in the right direction, but it is not nearly enough to make Wardens a desired tank in groups or raids. The core problem is the lackluster survivability of wardens and the huge amount of damage they take. Wardens are tanks with the ability to stack avoidances and rely on their selfheal like no other. Currently (raid)bosses are designed to have mostly hard hitting abilities which can't be blocked, evaded, or parried. Therefore all the Wardens Gambits which increase B/P/E have limited use against bosses (these Gambits are only great if Wardens tank trashmobs). This means Wardens have to suffer the big hits with their 50% mitigation (52% at best with Dance of War and Conviction). Since Mordor bosses hit even harder than before, increasing this problem by a great margin. At the release of AoM, Warden tanks were simply to squishy to survive the big hits. Now, with the Northern Strongholds Essences they finally can reach enough moral to tank the bosses. But Wardens are still very stressfull tanks even for good healers - they still take double, if not more damage than any other tank in bossencounters. Given your recent changes to Minstrels on BR, Wardens will once again be very difficult, if not impossible, to heal. Even BIS gear wont give them the ability to tank successfully. - Wardens have only a maximum of 52% mitigations and no way to effectively reduce their incoming damage from large boss hits. - Wardens have their only active mitigation/emergencytool tied to their AOE-Taunt. Given enough mobs are taunted, Wardens have 12 seconds of godmode of 90% mitigation. After that they fall back to their lousy 52%. As others stated this is a bad design. Not only can it wreck havoc on your raid/group if you have to use an AOE-Taunt compulsorily to get some mitigation in a pressing situation. If there is only one (boss)mob, your "emergencyskill" only gives you 60% mitigation for 12 seconds. Having a 12 second mitigationuptime and fearing 8 seconds to go SPLAT! is not fun at all. - Never Surrender as a "passive" emergency skill has lost much of its use, given how squishy Wardens have become. - Wardens have many Gambits/Traits which provide a raw value like +xxxx to physical or tactical mitigation. With the Essence-System, these Gambits are not very usefull. People prefer to cap their mitigations with the essences, because you can't always be sure (particullary as a tank who has to react to the flow of the battle) to have the time to keep your mitigation-giving gambits up. - Wardens have Gambits which boost their B/P/E by large amounts, but the buffdurations are too short. Once we had +10 seconds on defensive buffs, but imbued legendary items have stripped us of it. - A propper way to mitigate damage. 52% mitigation isn't enough, we need at least to be able to maintain 60% the whole time, not just 12 seconds. This could be well and easily achieved if you would scale up the +% mitigation which Dance Of War and Conviction provide. Otherwise the mitigations could be placed on Shield Mastery (+% phys. mit.) and Shield Tactics (+% tact. mit.). - A way to increase the duration of some of our defensive buffs (24/28 seconds is too short). - HoTs which are scaled/usefull in regards of Lvl 115 values (easily 170.000 moralpool). (- Propper itemization in the future. The agilitybase Armor and Jewellery has lower basevalues in vitality, which aggravated the squishyness of Wardens. Maybe you can find a way, in which Wardens could benefit from the +Healing Relics? This could also help with the HoT issue). - The Trait "Warcry" only gives +2716 Evaderating for 5 Traitpoints. This needs to be scaled in regards to the new Lvl 115 ratings. - The Trait "Careful Shieldwork" is okayish, but could use some adjustment upwards. - The Trait "Defiance" needs to be decouled from "Defiant Challenge". My suggestion is to perhaps make it a "real" emergenyskill like Shield Of The Dunedain or Guardians Pledge. Otherwise, you could implement the Reflect which Defiant Challenge gives into this Traitslot, so that you can chose to skill your AOE-Taunt without having a reflect effect on yourself compulsorily. Having a reflect compulsorily can mess up some of the bossfights like Ost Dunhoth - Huorns. - The Trait "Impressive Flourish" gives way too little bonuses for the possible 5 Traitpoints. This needs to be scaled in regards to the new Lvl 115 ratings. Or, like i said above, strip it off its +mitigation values, since the Gambits with +mitigation have no use, when players cap themselfs with essences. - The Trait "For The Free Peoples" is completely useless. Remove or rework it please to give it a meaningfull effect, worthy of a capstone. My suggestion is to maybe add the +10 second duration on shieldgambits we once had to a capstone. - The Trait "Fellowship Protector" is useless in its current state and not worthy of being a capstone. As I explained, players prefer to cap their mitigations with essences and don't rely on Gambits to get their +xxxxx mitigation numbers. My suggestion is, like said above, an increase to some buffdurations. Last edited by Imbrahil; May 11 2018 at 03:11 PM. - The Trait "For The Free Peoples" is completely useless. Remove or rework it please to give it a meaningfull effect, worthy of a capstone. - The Trait "Fellowship Protector" is useless in its current state and not worthy of being a capstone. As I explained, players prefer to cap their mitigations with essences and don't rely on Gambits to get their +xxxxx mitigation numbers. +1 Very well put. This info is pretty much a flawless top to bottom examination on class defects and how to potentially change them. I have experienced all of these same issues on Live as have every raid ready warden I've met on Arkenstone. I would be MORE than happy to sit this one out and have to wait a bit longer like Beornings do because as it seems to me, Warden is just as much of a mess as Beorn's are on live with regards to tanking. Hell, a Beorning has an easier time raid tanking than a warden does in the games current state.